I’m 43 years old (born on Dec. 1st, 1967) and live between Catania (Sicily) and New York, but I travel often around the world for various work assignments. I have a passion for everything that's beautiful, from architecture to automobiles, art and antiques. I adore domestic animals, traveliing, reading, writing, photography, driving and exploring. I'm a very curious person and like to take on challenges and make dreams happen. In my spare time I visit museums, art galleries and exhibitions worldwide. I'm Creative, romantic, independent, professional...and I only use Apple computers. 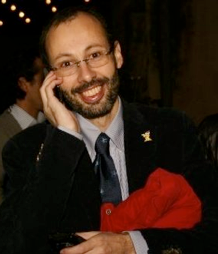 Mario Bucolo: Photographer, Marketing and Communication expert, Museumland.net publisher. He is also a renowned international expert in marketing, PR, communication and Social Media, mainly for museums, art and cultural travel sectors and is the founder and publisher of Museumland.net, the WorldWide Portal to Museums and Cultural Heritage. He was involved, from 1984, in relevant projects on multimedia, marketing, communication and social media. In 1995 the European Commission select Mario as co-founder of the Medici Framerowk, a project create to help european museums to deal with multimedia publishers. In the last five years he design and manage the worldwide most greatest multimedia museums network (55 museums involved with 100 installed multimedia interactive kiosks) and he was invited, as guest author, for a contribute in the last Philip and Neil Kotler museums marketing book. In the last 20 years, his studies was presented in most important international conferences about marketing and communication in the cultural sector. On photographic side, his photos have been recently awarded at PDN Great Outdoors Contest and with 2 honorable mention at the International Photography Awards 2011, Los Angeles (3 in 2010 and one in 2009 editions) and 4 gold, 1 silver and 1 bronze awards at PX3 Paris 2011 People Choice Awards and finalist at PX3 2011 Juried awards. Photos was also shortlisted for the final judging round in the 2008 Travel Photographer of the Year competition, in 2007 and 2008 "Human rights" International Competition co-promoted by Sicilian Parliament and he was personally awarded , in 2008 as "author in evidence" and in 2009 as "Finalist Author" in the International "Premio Fotografico" promoted by the National Association of Professional Photographers of Italy - Tau Visual.